KINGSBRIDGE - Absolutely Stunning 5BR/4.5BA home with a FABULOUS floor plan, CUL-DE-SAC lot, Covered Back Deck with Fireplace, Main Floor Master Bedroom & Additional Bedroom/Bath suite on the Main Level! You are in for a treat from the moment you drive up to this home! The Gorgeous Stone entrance is eye catching and the Circular Drive provides plenty of parking! Double Doors lead you into inside where you&apos;ll find a freshly painted home with the most welcoming floor plan! The Dining Room is situated upon entry with large windows looking out to the manicured front lawn and a private office with double doors is also situated when you walk in. It&apos;s the perfect place for someone who works from home! The Great Room has high ceilings with a fireplace and wonderful views to your back Covered area! The Kitchen and Great Room are open to each other and allow for plenty of space for friends and family with Bar Seating and Eat-In Breakfast Area! The Kitchen is stunning and features endless cabinets, a center island with storage, wine chiller, Gas Cooktop and Tile Backsplash. The Master Suite is privately situated in the rear of the home with a Sitting Area, Double Tray Ceilings, Two Walk In Closets, Full Bathroom and access your covered porch! Master Bath offers Double Sinks, Jetted Tub, and Spacious Tile Shower! Second Bedroom is conveniently located on the main level as well and has it&apos;s own Full Bathroom and wonderful closet space. The Second level could be a kids, grand kids or college students dream with two bedrooms and a Massive Bonus/5th Bedroom offering a Full Bathroom and Walk In closet! The options are endless for this Bonus Room that would be a wonderful 2nd Master as well! 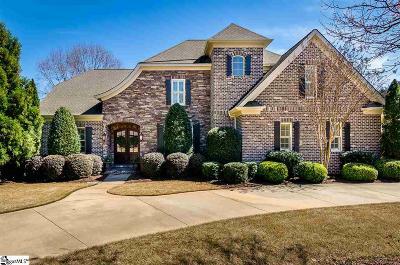 Additional upgrades/features include Plantation Shutters, Hardwood Floors on Stairs & Upstairs Hallway, and Walk-In Storage off One Upstairs Bedroom. Now to the part you&apos;ve been waiting for! Just in time for Spring, you&apos;ll find a Covered Porch featuring a Fireplace and Outdoor Kitchen. This is truly somewhere you could relax year round! The yard is fenced and could easily accommodate a pool! Neighborhood Amenities are First Class with a Gorgeous Clubhouse, Pool, Exercise Facility and Tennis Courts! Endless Shopping, Dining, Grocery Stores, Etc are located minutes from your doorstep!